In planning a journey it’s as well to understand the naming system: there are three levels of road categories, but it’s important to realise that this does not necessarily reflect the quality of build or standard of the road on the ground – a factor that SatNavs don’t take into account. The categories are; National, Regional and Provincial. National highways link regions and are the skeleton of the road system, emanating from Madrid with the numbers ascending as the roads radiate clockwise around the country to the coasts. National highways (Nacionales) are denominated with an ‘N’, dual carriageways (Autovías) are ‘A’ roads and toll roads (Autopistas or peajes) labelled ‘AP’. Regional roads are classified after their region, e.g. the C-14 is in Catalonia. However this system is full of ambiguities – the A-338 is near granada in Andalusia – and a very nice road it is too! – while the A-1604 is all the way up in the Pyrenees in Aragón – and an even better road! Autovias, e.g. A-23 and Autopistas e.g. AP-7 are part of the national highway system, so when you call a rescue service they will often mistake your location, claiming that there is no Autovia such and such and – this has hoard to me twice, even though I was standing next to the kilometre sign – and with the term¡aperture dropping towards zero after you mobile phone runs out of battery arguing the point you won’t believe how comforting it is when a Guardia Civil comes down the road! Autovia and Autopista junctions a numbered according to their distance from Madrid, the Puerta de Sol to be exact – there is ‘centralist’ syndrome in Madrid called ‘umbligismo‘, (Sp. umbligo = bellybutton)which refers not to navel gazing, rather a very limited, not to say parochial, point of view! Nevertheless this makes following or devising directions remarkably precise. Regional roads are named after the region, the C-14 is in Catalonia, for example. But there are important other factors to remember; regional roads are not necessarily related to their stature or quality, e.g. the Catalonian C-25 is a major trunk route right across the country, but in the same region the N260 between Olot and Ripoll is totally rustic. Likewise the T-11 in Tarragona is a full-blown dual carriageway whereas normally provincial roads are hardly more than country lanes – see below. The A 2514 Rudilla-Fontfria, October 29th, 2011. A wonderful if bumpy ride – shame about the weather! Provincial roads are named after their province, e.g. L-401 in Lérida. As a general rule these are lanes, especially if they have the suffix ‘V’ (Sp. vecinal (adj.) = meaning neighbourhood in this case), as in HU-V-9041, but not necessarily. 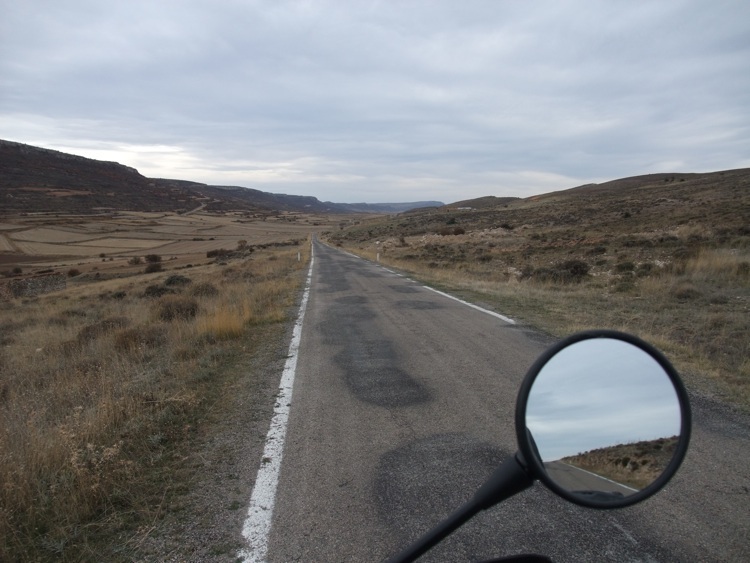 The L-401 is an important link in my Trans-Pyrenean route and is typical in that these roads can be the most rewarding rides to seek out – especially if you’re not in a hurry! At this level the numbering system is to obscure to be of much use, it is far better to consider what purpose the road is serving. For example if a road runs a short distance between two important looking towns then it’s likely to be well maintained. The reverse tends to be true when a local road crosses a border between two provinces and especially two Autonomous Regions, where each play a game of chicken in the hope that the central government will end up paying for upgrades! Furthermore, Provincial roads rarely labelled on the Michelin Regional series maps (scales 1:250 000 or 1:400 000), which I prefer, but do appear on Google Maps if you zoom in enough. A final point that is worth considering if you want to get well off the beaten track: the government policy is to prioritize access from towns to their nearest autovía or autopista. This can have a profound effect on local traffic flows, changing routes for logistics, for example. What this means in practice is that roads leading in the opposite direction will tend to have less traffic but may well have been well maintained until recently, as in the case of the national roads described above – so instead of letting the SatNav do the work, spread a map (up to date!) on the floor and devise your alternative by splitting the difference between the arterial network. That’s what I do and it has not failed me yet!